I love the premise of The Obvious Game. The game itself---pointing out obvious things as a game---was an interesting concept to me, and the reason why I accepted The Obvious Game for review. I had no idea that this book would affect me the way it did. I absolutely loved it! I was expecting your typical YA contemporary fiction, maybe with some high-school drama, so I was unprepared to read such an emotional, well-written story. Diana grew up overweight and has the resultant body- and self-image issues after years of being teased about her size. She begins dieting without really making a conscious decision to do so. Diana's mother has cancer, and Diana can't handle the stress her mother's illness is placing on everyone in the family, not to mention the fear of losing her mother. Diana meets Jesse, the new kid in town, and they have an instant connection. She starts running the bleachers while Jesse is in wrestling practice, and quickly begins losing a tremendous amount of weight. Diana's eating habits coincide well with Jesse's, as he struggles to keep his weight down for wrestling, to stay in the lower weight class. They both avoid eating, or when they do eat, eat very low-calorie foods. Diana's weight loss spirals out of control, and she feels like she is hiding it well, but she's not. I loved that The Obvious Game was set in the 1990's as it really took me back to my own teenage years. It was easy to picture myself as Diana, even though I've never been in her situation. I loved the conflict resolution Arens employed. It was realistic and very believable. I admired that Arens used therapy to heal Diana instead of the change happening magically. But my favorite part of The Obvious Game was the ending. It was just perfect! I won't say any more about it, so I don't spoil it for you, but the character growth and change was so satisfying. 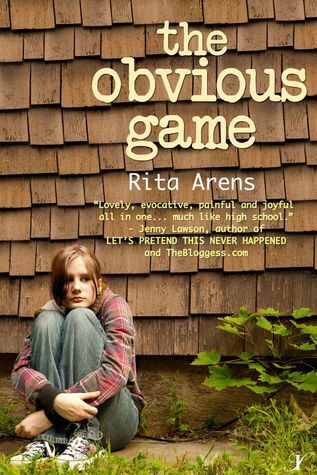 I loved The Obvious Game and would most definitely read Rita Arens again!